One of the most popular shows on TV today is the AMC hit “The Walking Dead.” Based on the comic book series written by Robert Kirkman (published by Image Comics), this drama portrays life in the aftermath of a zombie apocalypse. The story is about former police officer Rick Grimes, his family and a group of other survivors find themselves constantly on the move in search of a safe and secure location. AMC recently announced that the 9th Season of the Walking Dead has been named “Rick Grimes Final Episodes” – As such, we know that the character of Rick Grimes will be leaving the show (or possibly be killed off). 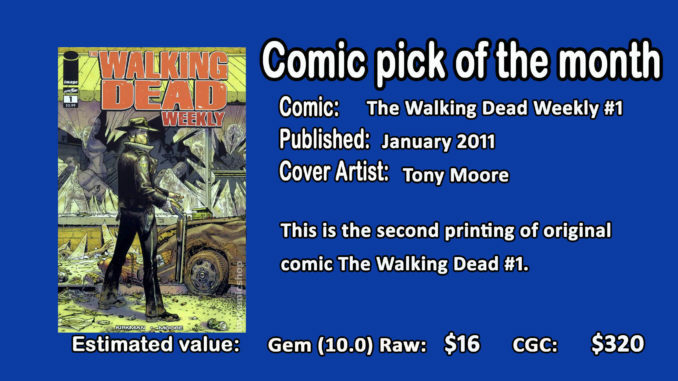 Because of this, his 1st appearance comic The Walking Dead #1 is speculated to rise in value. Presently, the original #1 comic of the Walking Dead of this series is in the thousand dollar range. Due to that fact, Hicollector recommends you pick-up the second printing of this comic “The Walking Dead Weekly” as the comic is not as expensive as its 1st printing counterpart. As this is a modern issue, you should be able to find one in a 9.0 or better condition.